Will you do the Right Thing when confronted with your next difficult decision? Will a clear conscience make you richer? Maybe not, but the leaders of companies like Enron, Tyco and others found that bad behavior can bankrupt you. 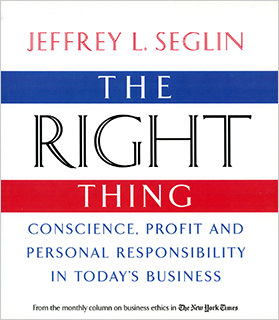 New York Times syndicated columnist and professor Jeff Seglin takes you through the difficult choices that companies make in the real world—how some do the right thing and others don’t. Find out how you can make good choices that make good business sense. Jeff Seglin “is a great teacher whose course you never want to end, and whose work is a great gift.” Jim Collins, author of Good to Great and co-author of Built to Last.